Can you confirm these amateur observations of Chamaeleo necasi? Type locality: Togo, West Africa (no speciﬁc locality data). Types Holotype: ZFMK 76922, adult male, native collector, without known collecting date. Diagnosis Diagnosis. 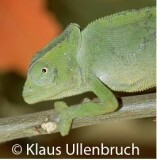 A stoutly built, ﬂap-necked chameleon belonging to the C. dilepis group within the subgenus Chamaeleo which is distinguished from C. dilepis by (1) the much smaller occipital ﬂaps, (2) a weakly raised parietal crest forming a distinct (though ﬂat) helmet, (3) the highly elevated dorsal crest which is supported by elongated neural spines of the dorsal vertebrae, (4) a weakly expressed, merely indicated temporal ridge, (5) the possession of four (instead of three) fully differentiated sulcal rotulae on the hemipenis, and (6) much smaller calyces on the trunk of this organ. In contrast, C. gracilis has only rudimentary skin folds in the occiput, a much ﬂatter head and a much lower dorsal ridge. C. quilensis is comparable in lobe size, but has a less raised parietal crest, a much lower dorsal ridge, a different shape of hemipenis, and marked sexual dimorphism in size, the females growing considerably larger than males. This is true — and even more pronounced — for C. roperi, whose occipital ﬂaps are separated by a gap in the nape, (they are in contact in C. dilepis and in necasi n. sp.). Moreover, C. roperi has only two differentiated hemipenial sulcal rotulae, versus three in C. dilepis and four in necasi n. sp. Etymology named after Petr Necas, Czech herpetologist.